Hipster Brewfus: Fall Is Here, Time For Sports and Beer! : A Guest Post From Blake D.
Fall Is Here, Time For Sports and Beer! : A Guest Post From Blake D.
Blake D. recently contacted me through the website to see if I would be willing to have him on the site. me, being the jovial and lazy guy I am, thought "HELL YEAH!" 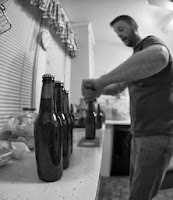 He wanted to gain some beer-related writing experience and I just happen to love having beer-related writing on my blog.Match made in heaven, am I right? The following post is well written, makes me hungry, and Is totally perfect for the season that is among us. Hope you enjoy the latest guest post! Fall is upon us, and with that comes the start of football season and the MLB playoffs aren't too far behind. That also means that, if it hasn't already started, game day party season will soon be in full effect. No matter who you’re rooting for, a full spread of snacks and beer is a staple of any party, so make sure that you’re well prepared before you and your neighbors get together to scream at the TV. Having hosted quite a few get-togethers myself, I can tell you from experience that there is a good amount of work that goes into them, no matter how informal they are. Football or baseball parties are simple in the sense that you have a theme right off the bat; sports. Food-wise, it’s a little more of an undertaking. Of course you can have chips and a variety of dips, but for bigger parties, for the games you care about and have friends over for, that’s when you should bring out the big guns. Here are a few ‘go-to’ recipes, and suggested beer pairings that are time tested and have always been a hit. 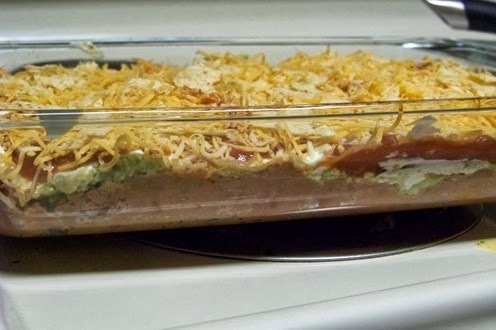 If you aren’t the most confident person in the kitchen, one of the easiest dishes you can make is a 3-layer dip. Take a shallow dish (0.5-1” thick). Spread the cream cheese evenly on the bottom of the dish. Spread the chili as the second layer on top of the cream cheese layer. Top off with a layer of salsa and cheese (as much as you want) and then you’re done. Pop the dish in the microwave until the cheese melts and serve with some chips. This dip would go great with any style, but you should probably have some of these good old Lite American Lagers on hand for your friends that aren't that into craft beer. Preheat the oven to 350˚F and line a baking sheet with aluminum foil. Roll out the dough on a flat surface and split apart into the precut triangle portions. 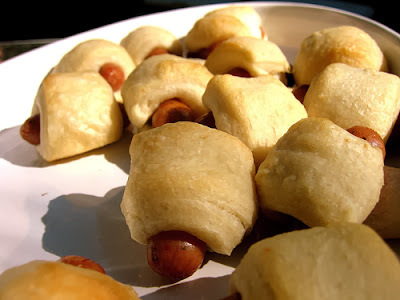 Place a hotdog along the edge of one of the sides, then roll the dog toward the remaining tips of the triangle, making sure to leave both ends of the hot dog free. Repeat for all the hot dogs, placing them on the cooking sheet as you go, and then cook them for 10 minutes or until they are lightly browned. Serve with ketchup and beer mustard, and you have a great appetizer. The rich malty flavor of the Oktoberfest style matches up well with the toasted dough and fits in perfectly with the season. Clean the chicken and boil it for 5 minutes or until the outside of the breast is white. Take the chicken breasts and put them in a slow cooker with the hot sauce on low heat for 6-7 hours. Around the 6 hour mark add the cream cheese and mix it with the hot sauce and chicken, pulling the chicken apart as you go. If the chicken doesn’t come apart easily, leave it in the pot for another hour and then shred it apart with a fork and it’s ready to serve. 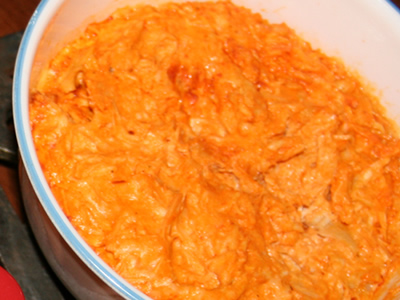 You can add more cream cheese if the dip is still too spicy for your taste. Big, hoppy IPAs can stand up to the heat in spicy foods and make a great pairing for this dip. Now that you have your food squared away and a few ideas for beer to stock up on, it’s time to set up your game area. Have a table set up with all your food items, for easy access during the game. No one wants to miss a game changing moment. As for serving the beer, having some accessories like a set of beer glasses, or even a freshly filled growler is a great touch. After you have the food and drinks set up, all you need to do is sit back, relax and watch the game with your crew.